Especially effective in denying birds access to areas such as light-wells, underside of canopies, roof-top plant enclosures and building facades. This system is also effective for protecting ornate features such as column capitals, embellished tympana and porticos without detracting from the aesthetics of the building. The net is UV resistant polyethylene and attached by means of BS316 grade stainless steel fixings and is fixed taut using tensioned perimeter wires. The result is a high quality tensioned Bird net sealing the perimeter and denying birds access. 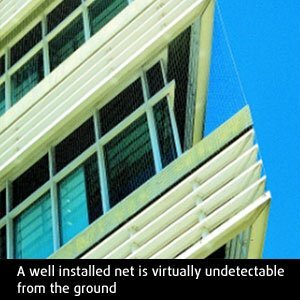 Correctly installed nets are virtually undetectable from the ground.